"This recipe is quick, easy and delicious! The great part is you can use whatever leftovers (well...almost) you have on hand. This dish can be served hot or cold. Freezes very well! Use any cheese of your choice. Meat suggested: chicken, ham, or bacon. Vegetables suggested: zucchini, spinach, or broccoli." Preheat oven to 350 degrees F (175 degrees C). Generously grease a 9-inch pie pan. Spread shredded cheese across bottom of pie pan. Cover cheese with meat and vegetables. In a blender, combine eggs, baking mix, salt, garlic powder, onions, parsley, and milk. Blend until smooth, then add olive oil. Blend until combined, then pour mixture over meat and vegetable layer. Sprinkle with paprika. Bake in preheated oven for 40 minutes. Cool 10 minutes before serving. A delicious, quick-and-easy quiche with broccoli, ham, and cheese. when i made this it was VERY oily, i dont know that the oil is necessary. I've made this dish many times. It tastes good and it's easy to make. My only complaint is that there's too much liquid. I cut the liquid down to cup and added 20 minutes to cook time. i've made this recipe 3 times, with different ingredients each time, and it always turns out perfect! 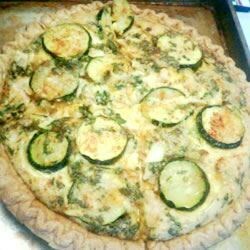 so easy and light - this is quite possibly the best quiche i've ever had. it's foolproof! My first quiche. Potluck success! Good feedback and requests for the recipe - the signs of a 5 star recipe!